A lot of specific legal phrases are Latin phrases or at least started out Latin. 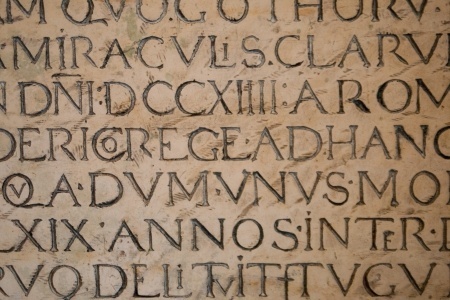 Latin, italics, and punctuation are more than a little confusing so we will take a little time today to try to make those things a little bit clearer. The Latin word id. is always italicized (including the period following the “d”). Note that id. is used to refer to the immediately preceding citation in a document but ONLY when the immediately preceding citation contains only one authority. Also, if you are using id. in a footnote, it must be used only when the immediately preceding citation is within the same footnote or in the immediately previous footnote and that footnote contains only one authority. If you are responsible for cite checking documents, keep this in mind. And if you are responsible for typing documents, keep this in mind as well—in addition to italicizing the period after id. These are important (and overlooked) details. In a continuation of last week’s article Should We Use Italics or Underline?, we will talk about titles of literary or artistic works. Do underline or italicize complete works (books, newsletters, magazines, newspapers, movie titles, etc.). The latest issue of @Law magazine just arrived in my mailbox. As an alternative, complete works may be in all caps; however, if the complete works are being prepared for publication, they must be underlined or italicized to show the publisher that it must appear in italics in the final version. Do not underline or italicize the word “magazine” unless it is part of the title of the magazine. Do italicize or underline when referring to the name of a publication that is the same as the name of the company, but do not underline or italicize when making reference to the company and not the publication. Fortune included a list of the Fortune 100 this month. Do not italicize or underline the name of a publication when it is an organizational name. The Arizona Attorney Editorial Board is responsible for the content of the Arizona Attorney magazine. Do italicize or underline titles of books, newspapers, and magazines that are published in electronic form. Do not italicize or underline titles of video games or other games. Do not italicize or underline titles of computer software. She definitely thought the grass was always greener when she left her job last month. 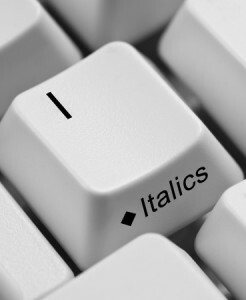 Traditionally, the punctuation after an italicized word was also italicized. Now, however, the new guideline is to treat the punctuation the same as the main part of the text, not the same as the italicized word right in front of it. Her favorite magazine was Motor Trend; however, she could be spotted from time to time reading Cosmopolitan. However, if the punctuation is part of the italicized element, it will remain italicized. Who’s Afraid of Virginia Woolf? plays at the amphitheater next Saturday. 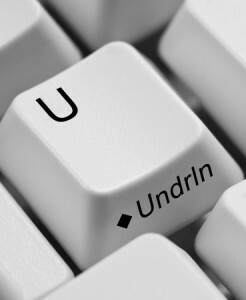 When underlining, do not underline the punctuation unless it is part of the underlined element. When using run-in headings, do not italicize or underline the punctuation that follows the heading. When you have an italicized or underlined element or word being emphasized with a possessive or plural ending added, do not italicize or underline the ending. The new guidelines are that parentheses either before or after an italicized or underlined element are not italicized or underlined, they are treated in the same way as the main text. This reminds me of underlining or italics with case citations. When using et seq. or et al., since the period is part of the word, it is italicized or underlined. Any punctuation following that period (as in the second example) is not italicized or underlined. That’s a lot about italics and underlining. Is there something you have a question about? Add a comment and we can learn together in another post on Proof That proofreading blog. Should We Use Italics or Underline? Comments Off on Should We Use Italics or Underline? In legal documents, it seems that italic type is used more frequently than underlining—likely because The Bluebook: A Uniform System of Citations has changed the treatment of cases cited from underlining to italics as long as it meets court rule requirements. Well, that, and the fact that computers made the use of italics much easier. I think italics looks better than underlining, but that is personal preference. Here are some rules for italics and underlining. When you are referring to a word by using “the term” or “the word,” that word should be in italics. The word secretary originally meant the keeper of secrets. Referring to letters as letters should be italicized or underlined if they are not capitalized. In this case, underlining may be preferable since the letter is so short that italics may not be readily apparent. Do not underline or italicize the pluralization of the letters, however. He was looking for the value of x when y= 100. She was reviewing the document to make sure she had dotted her i’s and crossed her t’s. Use all capital letters sparingly for emphasis. As you know, in email, all caps is considered screaming so it is not appropriate in business writing. When you are defining a word in your writing, the word being defined is generally italicized. An informal definition does not require special punctuation (but titles of TV series do). I spent the weekend watching one episode after another, or binge-watching, Downton Abbey. Italicize foreign expressions that are not part of the English language. We learned to say Buongiorno (or “good morning”) to the shopkeepers in Italy. Once a foreign expression has become established as part of the English language, it is not italicized. She ordered her pie à la mode. We will continue this discussion next week with literary titles and artistic works and some basic guidelines.